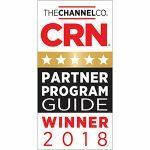 CRN®, a brand of The Channel Company, awarded the GFI Partner Program five stars in this year’s edition of the 2018 Partner Program Guide. According to CRN, the 2018 Partner Program Guide offers the information solution providers need to evaluate IT vendors they work with or are considering working with. Over 270 vendors submitted detailed applications, outlining their partner’s programs and the GFI Partners Program was given the highest rating of five out of five stars. The GFI Partner Program offers competitive solutions, pricing, and comprehensive support for IT resellers and Cloud service providers worldwide. The GFI Partner Program has a low barrier to entry, giving IT resellers and Cloud service providers the ability to quickly expand their portfolio with business-proven network security and communications solutions to their customers. GFI also offers an extensive menu of technical and training resources online and on-site, making them an ideal choice for partners around the world. The GFI Partner Program wants IT resellers and Cloud service providers using GFI products to succeed by offering IT resellers and Cloud service providers the support they need to expand their business, including market development funds (MDF), channel marketing and other tools. GFI Software recently announced an exciting opportunity for partners to provide a full library of business-proven network security and communications solutions with GFI Unlimited. This game-changing subscription gives their customers a chance to access a full library of software to run their businesses more effectively and efficiently. “…We recently launched GFI Unlimited, so that our partners can provide customers with access to all the right-sized business software they need, when they need it, for one predictable, low cost,” explains Johannes. Find out how you can join the GFI Partner Program today!